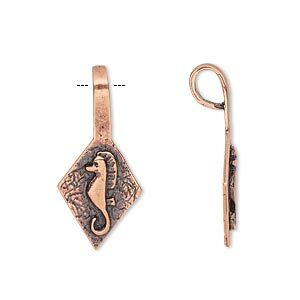 Bail, glue-on, antiqued copper-plated brass, 27x12.5mm with 18.5x12.5mm textured diamond flat base and seahorse design. Sold individually. Easily transform a cabochon, undrilled focal or clay creation into a pendant with this glue-on bail. Loop inside diameter measures 3.5mm. Use with a permanent glue such as Jeweler's Epoxy or Loctite® 454 Gel. 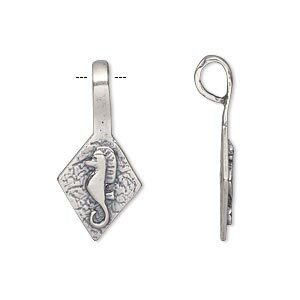 Bail, glue-on, antique silver-plated brass, 27x12.5mm with 18.5x12.5mm textured diamond flat base and seahorse design. Sold individually. 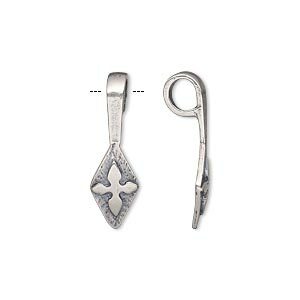 Bail, glue-on, antiqued silver-plated brass, 24x7mm with 15x7mm textured diamond flat base and cross design. Sold individually. 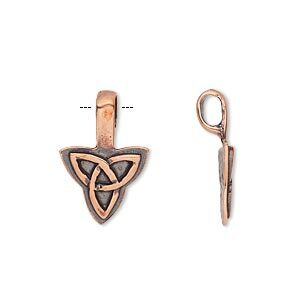 Bail, glue-on, antique copper-plated brass, 20x13mm with 13x12mm triangle flat base and Celtic knot design. Sold individually. 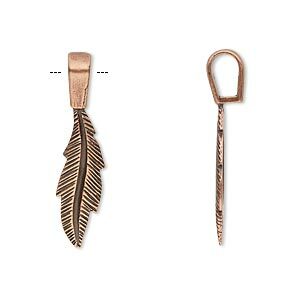 Bail, JBB Findings, glue-on, antique copper-plated brass, 29x7mm with 20.5x7mm feather flat base. Sold individually. 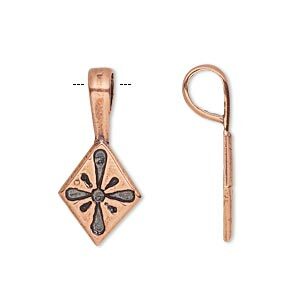 Bail, glue-on, antique copper-plated brass, 26.5x12mm with 15.5x12mm diamond flat base and flower design. Sold individually. 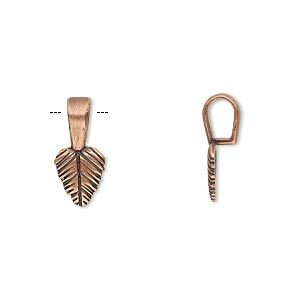 Bail, JBB Findings, glue-on, antique copper-plated brass, 16x7.5mm with 8.5x7.5mm leaf flat base. Sold per pkg of 2. 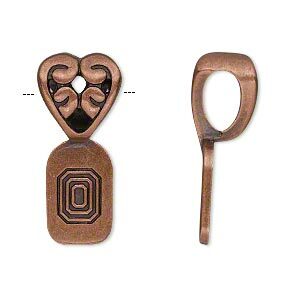 Bail, glue-on, antiqued copper-plated "pewter" (zinc-based alloy), 28x12mm open filigree heart with 16x10mm flat base. Sold individually. 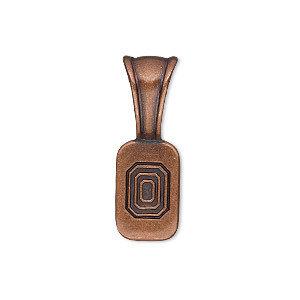 Bail, glue-on, antique copper-plated "pewter" (zinc-based alloy), 27x9.5mm fluted design with 15x9.5mm flat base. Sold individually. 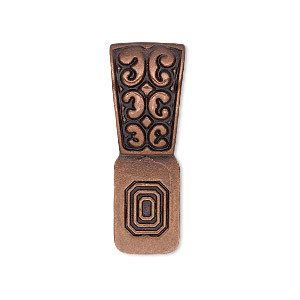 Bail, glue-on, antique copper-plated "pewter" (zinc-based alloy), 31x11mm fancy design with 14x10mm flat base. Sold individually. 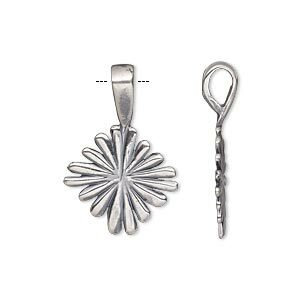 Bail, glue-on, antique silver-plated brass, 25.5x17mm with 18x17mm starburst flat base. Sold individually.